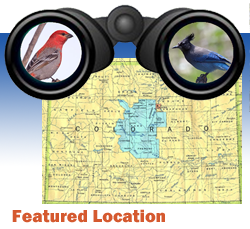 These are the two commercial atlases most often used by birders in Colorado. Either will suffice to get you around the state. Older versions of DeLorme did not provide as much information on public/private land boundaries as Roads of Colorado, but newer versions are comparable. The main difference now is that Roads of Colorado maps the whole state at the same scale, while Delorme "skimps" on the Eastern Plains, "zooming out" to fit them on fewer pages. This is the statewide standard in this genre. Keep an eye out for the completely revised and expanded 5th Edition! Affectionately known as "Bob & Bob", this book is the standard reference on bird distribution in Colorado. This excellent reference covers an area slightly larger than the western tier of counties in Colorado.